I had a decent nights sleep and woke up feeling better than I was yesterday. I am still hacking with a juicy, rattling cough, and runny nose, but not nearly as achy as I have been during the past three days. I am taking this as a win; I am going to kick this thing, hopefully, soon. The breakfast fairy delivered breakfast again, and I tried my best to choke down enough food to take my Bosulif. I managed, but barely; I just have no appetite and the thought of food is nauseating. After a few hours, we decided to venture out and give it a go. It is really difficult to be in an amazing city and not go out and explore. Our first stop is literally right down the street; Matthias Church. This church is a Roman Catholic church that was originally built in a Romanesque style in 1015. The current building was constructed in Gothic style during the second half of the 14th century and was then restored in the late 19th century. It is considered one of the most beautiful churches in Budapest and Europe. It is one of the best-known landmarks in Budapest. Fortunately, they allowed us to enter the church for free and we didn't have to wait in the ticket line. We thoroughly enjoyed walking through the stenciled church and loved the muted colors. Apparently, you can get married in the church; what a fairytale that would be! not sure who is buried there? at the bottom of a Virgin Mary??? Prettiest Bust I have seen. We then mosied on towards the Fisherman's Bastion, which looks like a castle, and is part of the castle wall. It is built in Neo-Gothic style and named after a guild of fisherman that defended that stretch of wall during the middle ages. The view of the Parliament, the Danube River and city below are staggering. We have not walked along the top of the wall yet, but hopefully, we will be able to before we leave. It is quite the site. After we left there, Joe told me a story about the students in Budapest that had a tradition of rubbing the testicles of a bronze horse statue; it apparently brought them luck on their exams. Because of this rubbing, the testicles are the only part of the monument that a shiny gold, the rest of the monument is a tarnished green! So of course, I had to photograph them for you to see! Since I was still hanging in there, and everything is so close, we walked over to the Toth Arpad Promenade, a walkway that is lined with cherry trees in full bloom. It is glorious! When you are up high on the wall, you can see the rest of "Buda" which is rolling hills, with homes and buildings dotted on the landscape. In some ways, it reminds me of southern California. We decided to take the stairs down to the street below, thinking that we might check out the Hospital in the Rock, which conveniently was located right near the bottom of the stairs. Upon entering the tour site, we were given complimentary tickets and quickly joined a group that had just begun. 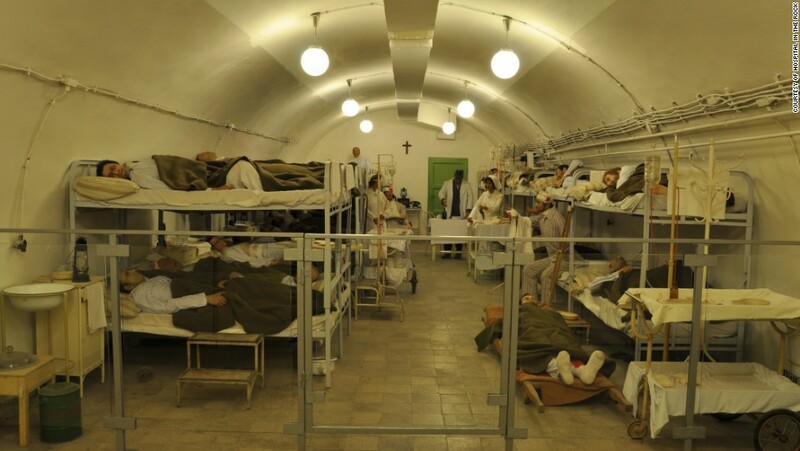 It was fascinating the way that they literally built a hospital, a water sterilization plant and a nuclear shelter in a webwork of caves that were below the castle area of Buda. I did not take this photo! Apparently, they saved thousands of lives and were out of the harms way from the fighting that was going on above them. 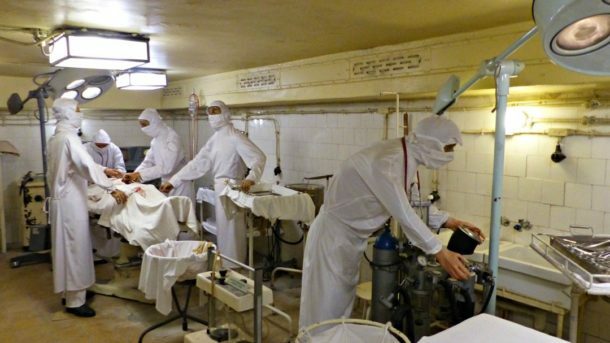 This secret hospital remained "Top Secret" until seventeen years ago. It is situated right below Castle Hill, where all of the political leaders were. After that tour, we had to take the stairway back to the top, as the lift was out of order; slow and steady wins the race! I made it to the top without too much distress. We meandered down to the other end of Castle Hill with thoughts of dinner, and then home to bed. What we found was the Funicular and some sort of ruins, of what we do not know. There was a cute sleeping kitty in the midst of all of that rubble, curled up in a ball. On our way back towards "home", stumbled across an Apothecary Museum: Arany Sas Patikamuzeum, which we enjoyed strolling through. The old scales, mortars, and pestles were impressive in quality and size. It was a small, yet interesting museum and we were glad to have found it. Along our way, we saw an amazing array of signs, flowers, cafes, and monuments. There is no way to know who and what they all are, so I just took photos of the ones I liked and moved on. Eventually, we found ourselves hungry, with three restaurants to choose from. Wouldn't it figure that the one we chose did not open until six and it was only five fifty? I could not believe that she didn't just let us sit down and wait ten minutes, but instead, we walked down the street for a few minutes, and then just went and parked on their chairs outside and waited. Finally, six o'clock arrived and we walked through the door. We were literally the only people in there. I asked whether or not they typically were busier, later, and she said yes, that they have live music starting at 7 pm. We figured that maybe we would catch some of the music before we left. I told her that we typically ate later, as well, but somehow we had missed lunch! The place was lovely, and she warmed up some and became more friendly after we chatted. After discussing the menu with her, Joe ordered Beef Hungarian Goulash with dumplings, and I ordered a turkey breast stuffed with chestnut dressing covered in a cherry sauce with croquets. For an appetizer, we had a "pancake" chicken filled crepe with a paprika sauce over the top. Nut filled "pancake" with chocolate sauce. Everything was SCRUMPTIOUS and hit the spot. For dessert, Joe had a nut-filled "pancake" with the darkest chocolate sauce we have ever seen, or tasted, Just like everything else, it was delish. While we were eating dinner, a woman and her son came in, and the musicians also arrived. I could hear them tuning up in the back; there were a guitar, a violin, and a bass. They shortly took their places and began to play for the only two tables in the place. As soon as they started playing, both the woman and her son shot up and literally ran to the back to the waitress saying, "You MUST stop this music!! It will give me a seizure! I get seizures from noise. I am sorry, and I will eat as quickly as possible, and leave." They stopped the music and she started shoveling her food. I walked over to her table, and told her not to rush, as we were getting ready to leave anyway. She said that she was sorry and that she had noise canceling earbuds in her ears, but the music would give her a seizure. I found it odd that the noise from her son's phone, which he played all through their dinner, apparently did not trigger her seizures, as it was grating on my nerves throughout dinner. They quickly left and the violinist came over to our table and played Dr. Zivago, and then asked for another favorite. Joe requested Fiddler on the Roof, and then he played "his" favorite, which I asked him to do, and it seemed to be some type of Hungarian Folk Song; very fast. When he was finished, he literally asked Joe to buy him a shot of Schnapps! Joe was like really? for everyone? and he said, "Yes!" Talk about gall! lol At any rate, Joe bought them all, including himself a shot, which they all did together. it was a little awkward as we had already settled our bill and were preparing to leave. I took a tiny sip, and boy, oh boy! It was not like any Schnapps I have ever had. They said it was made from Quince. Maybe I should have done a shot, too; it might have cured me! Back to the apartment after that, a hot bath, a recap and lights out. It was a good day, and I feel extremely fortunate to have recovered enough to do what we did today. Three days ago, I never would have dreamed it possible. Thanks for all of your prayers and well wishes; they mean the world.